I cannot believe Fall is here already! Daylight Saving Time ends on 2nd Nov; that is a painful reminder that good days are over. Each time of the day, including peak afternoons, is accompanied by cold winds; the sun is hiding behind clouds. Gosh, summer is really over! This whole week, I have been layering and covering myself completely because not just outside, inside of my workplace is freezing too. Well, not exactly freezing, but that’s how it has been feeling. Of course Fall dressing can be fun – plaids, infinity scarves and boots. But it also makes me sloppy and immobile. I also dislike wearing jeans the whole day. I crave the freedom summer provides. Summer is 5 months away and I am already longing for it. Not good! Here is my outfit post from 2 weeks ago. Even though mornings were nippy, afternoons were scorching hot. I bought this Ann Taylor shirt recently and even though it is one or two sizes bigger, I enjoy wearing it. Oversized shirts look great tucked-in into pants or skirts. I also like the fact that it is block printed. 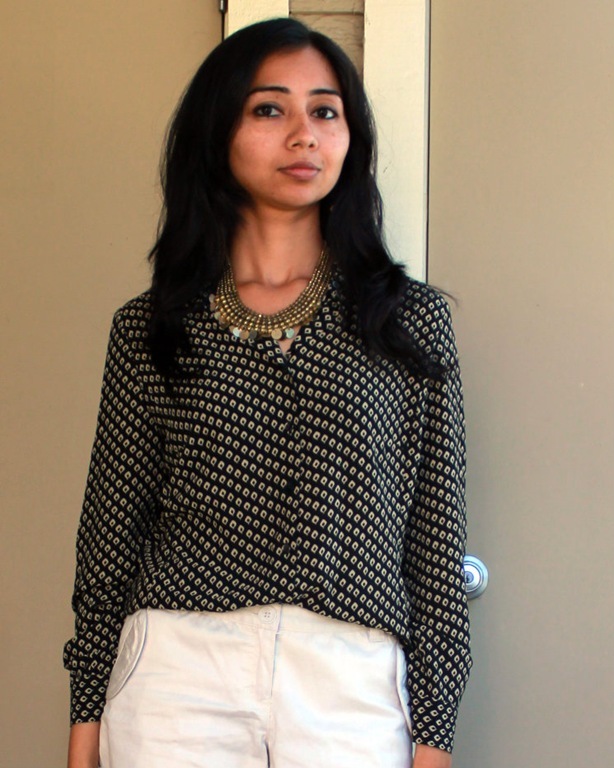 A wonderful ethnic touch to a casual Californian look. This entry was posted in Casuals, Fashion, Outfit Post, The Basic Closet and tagged ann taylor, block print, booties, california casuals, california fashion blog, india fashion blog, ootd, Outfit Post, oversized shirt, san jose bay area fashion blog, shoeties, shorts, the basic closet on November 1, 2014 by NS.